With the unwarranted attack on an outlying city by Magna Verden's nuclear weapons program, the Sovereignty had no choice but to declare an all-out war against the aggressors. Though the original one who declared the act, Dimitry Azarias, has been dead for some time, his child and successor seems to be just as disinterested in peace as he is in actually enforcing the war. Add to that the unconfirmed rumors that Magna Verden was framed (though with a lack of evidence to support such ideas), and one may find that this war is somewhat more complicated than what may appear to be. The Thirty-Second Legion, under the command of Aurel Syrael Driskel, continues its slow advance from the city of Mundaria to pursue the retreating forces of Magna Verden on his campaign to claim the country's southern coastline. Under pressure from officials in the government, General Driskel has slowed his campaign's progress as requested. The remainder of the invasion force, led by Driskel's vice commander, Joseph Starva, is currently holding at the Mundaria Defense Line, awaiting resupply and reinforcements, whilst also dealing with small groups of holdouts in the region. They will continue this until they are prepared to continue the invasion plan and head north. 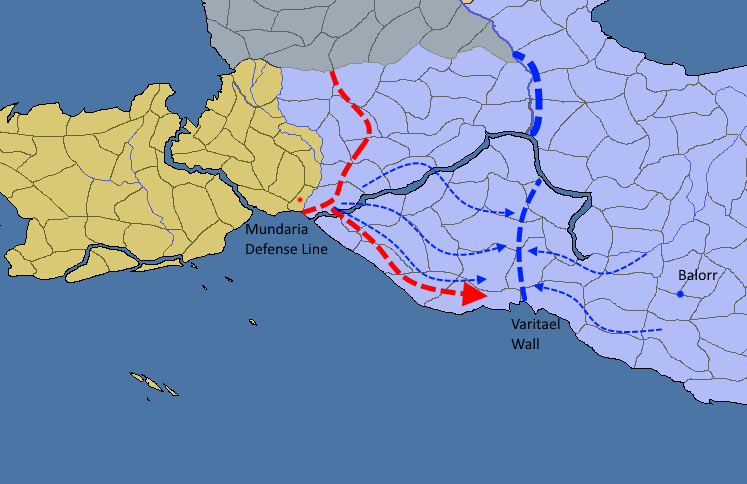 Magna Verden's Fourth and Fifth divisions, currently lacking a leader, are retreating in three separate groups to the Varitael Wall, a defensive position being constructed and reinforced by the Eighth and Ninth divisions from Balorr. Under the command of veteran general Albert Varitael Gavrill, the Wall was positioned to cease the Virisian advance towards the capital city of Mundusium as well as key ports used to resupply fleets and forces across the coastline. On the eve of morning, a small force was dispatched from the advancing Virisian army to intercept a retreating Magnarian force. The resulting battle took no longer than an hour, with the annihilation of the Magnarian force that outnumbered the Virisian task force. Casualties were total for the Magnarians, but marginal for the Virisians, as their advance continues onwards to the wall. The remainder of the Magnarian force that retreated from the battle of Mundaria have rejoined and reorganized themselves under the command of General Gavrill, who is intent on holding his defensive line against the ever-advancing Virisian army. 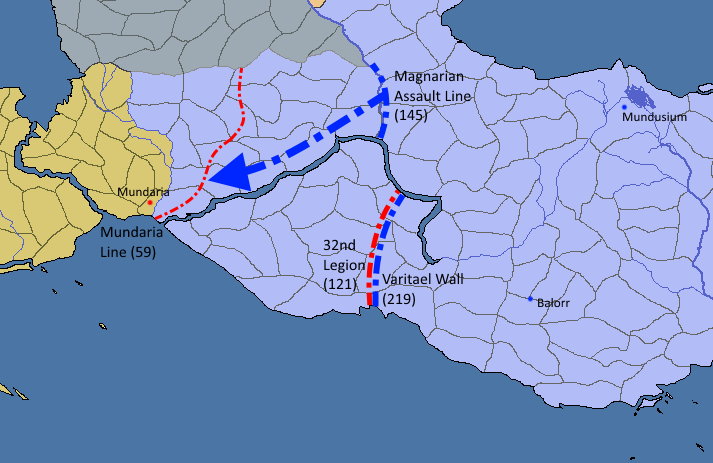 The Thirty-Second Legion is intent on not allowing Gavrill the time or manpower necessary to fortify, and has ramped up its march and its attempts to prevent supplies and forces to successfully retreat to what is now being referred to as "The Wall." In the meantime, Magna Verden is intent on garnering domestic support to continue their defensive campaign. 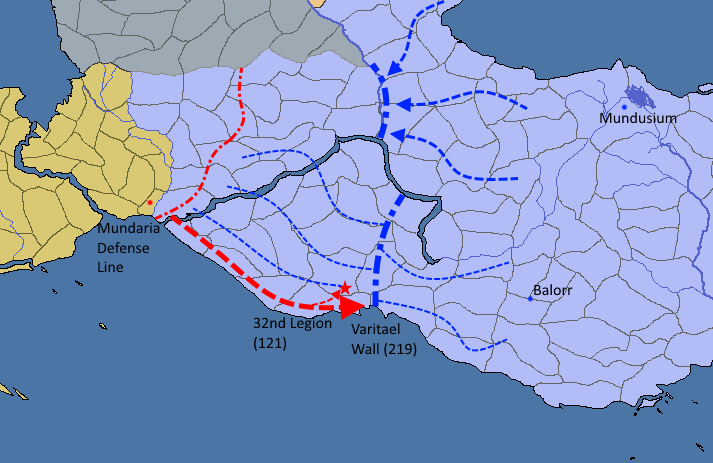 To accomplish this, they are gathering forces north of the ravine above the Varitael Defense Line, likely in order to assault the Mundaria Defense Line while most of the 32nd Legion is spent at the upcoming battle of "The Wall." There are also unconfirmed reports of nuclear arsenals being prepared for use against the Virisian invaders, though officials refuse to comment or acknowledge the matter. Again, not exact, just for appearances. With the 21st through 23rd divisions massing in the north, Driskel may be seen as hard pressed to keep the situation contained. However, he appears disinterested in the massing armies of the north and is focusing his attention on the Varitael Wall. Having stopped a short distance from there, he has begun a preliminary bombardment of the fortifications found there in an effort to buy time for setting up his attack on Magna Verden's forces, as well as to soften his enemy. The 5th, 6th, 8th, and 9th divisions under the command of Gavrill are holding steady at the line, continuing to fortify and returning fire with their own artillery. No nuclear weapons launches have been detected thus far, but many are still concerned about them potentially being used on the Virisian homeland, as the silos have thus far gone undetected, and thus are unharmed by the Heaven's Fall network. Joseph Starva, in command of the remaining forces at the Mundaria Defense Line, has already requested additional supplies and forces to deal with the massing threat. However, sources believe that forces will not arrive in time and that if they attack within the week, he will have no choice but to attempt to hold with what he has remaining to him. Unable to convince Driskel to return to the line to defend against the Magnarian assaults, he is on his own.